Recently, my family has been eating lots of quinoa and let me tell you, I’m taking advantage of it by making as many Weight Watchers quinoa recipes as I can! Today’s recipe is very simple. It’s just your ordinary Greek Salad recipe but instead of using lettuce as a base, I used quinoa. Quinoa is not just a great way to change up your salads. It’s a great substitute for rice or noodles. While it still has quite a bit of carbohydrate, it’s got plenty of fiber and lots of protein as well. It’s a good source of unsaturated fatty acids (the “good” fats that are important for healthy brains and hearts). Quinoa is also a good source of B vitamins include folate, and minerals, including iron. One of the great things about quinoa is how easy it is to add to your meal. I just adore the slightly chewy texture and the nutty flavor that the quinoa has. You can use the regular, light-colored quinoa, or you can use a red or black quinoa. Mixing the colors of quinoa is a good way to add some color to your meal. When it comes to cooking quinoa, it’s easy. If your quinoa hasn’t already been rinsed, you should begin by rinsing the quinoa. Many boxed quinoas have already been rinsed, but if it hasn’t been rinsed or you’re not sure, just give it a quick rinse in a mesh strainer under running water. This removes the saponin, a natural coating found on the quinoa. Saponin can make it taste a little bitter or soapy, so just give it a quick rinse. Once you’ve gotten your quinoa rinsed, you can toast the quinoa in a little oil in a small pan. I don’t usually bother with that step, and it turns out fine. Next, just add your liquid and quinoa to a pan, bring to a boil, then reduce heat and cook on low for 15 minutes, covered. Once it’s cooked, let it stand for 5 minutes and then fluff and eat. I love how hands-off quinoa is to make. While the quinoa is cooking, I can get the rest of the ingredients ready and when the quinoa is done cooking, my Greek salad is ready to add to the quinoa. But, if you’d like an even easier way to do it, just use your rice cooker or multi-cooker on the rice setting. Combine the quinoa and water in the cooker, turn on the rice setting and walk away. I love to make some up in my rice cooker at the beginning of the week and add it to my lunches or have it as an easy side dish for the rest of the week. The directions on the package usually call for using water in your quinoa. If you’re not a fan of the flavor, or are a little skeptical at first, use a little fat free chicken broth to add a little more flavor to the quinoa. You could also use half chicken broth or just add a little bit of chicken bouillon to your water to add a little more flavor. This Greek Quinoa Salad is the best! It’s so much more filling than a standard salad and it’s so incredibly flavorful. I’ll often serve it on a bed of butter lettuce or add some grilled chicken, fish or veggies to make it a whole meal. 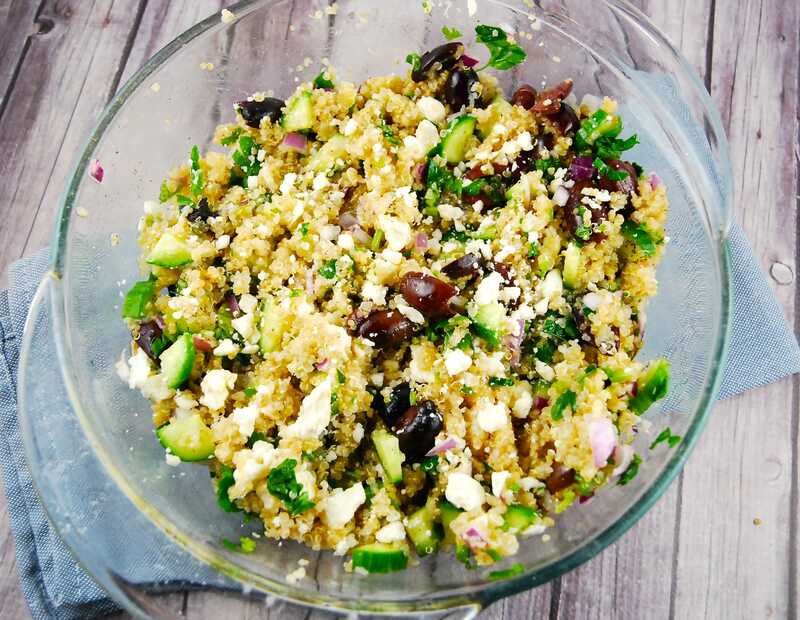 Greek Quinoa Salad is a great dish to take to potlucks and barbecues as well, so if you’re looking for some ideas of dishes to take along and share, this is it. Enjoy! All the traditional flavors of a Greek salad, but in a more satisfying form with the healthy benefits of quinoa. It’s a simple salad that’s hearty and delicious. Cook quinoa according to package directions, set aside to cool. Once quinoa is cooled to room temp, add in remaining ingredients, and toss well to combine.